Coeur d’Alene, Idaho – August 29, 2018 – Timberline Resources Corporation (OTCQB: TLRS; TSX-V: TBR) (“Timberline” or the “Company”) is pleased to announce that exploration drilling has begun at its Elder Creek porphyry copper-gold project in the Battle Mountain Mining District of Nevada. The Company will also conduct a district-scale gravity survey on its Eureka project and will target high-grade gold mineralization at depth in the Lookout Mountain area. The Company is also pleased to announce the appointment of Mr. Donald McDowell as Vice President of Corporate Development. At Elder Creek, the work program includes approximately 2,500 feet (762 meters) of reverse circulation drilling to test the grade and continuity of copper/gold mineralization within a large, porphyry copper system defined by geologic mapping, surface sampling, zoned alteration, geochemistry, and an aeromagnetic survey (Figures 1 and 2). Our initial drill hole expands on mineralization intersected in five vertical holes drilled when copper prices were less than $1.00/lb. These historic drill holes intersected continuous copper mineralization grading 0.2% to 0.3% from surface to their maximum depths of 200 to 300 feet. Timberline’s initial drilling will test the depth extend of the copper mineralization to allow design of a more extensive follow-up program. The Elder Creek copper/gold system lies approximately 11 miles (18 km) north of Newmont’s Phoenix mining complex. 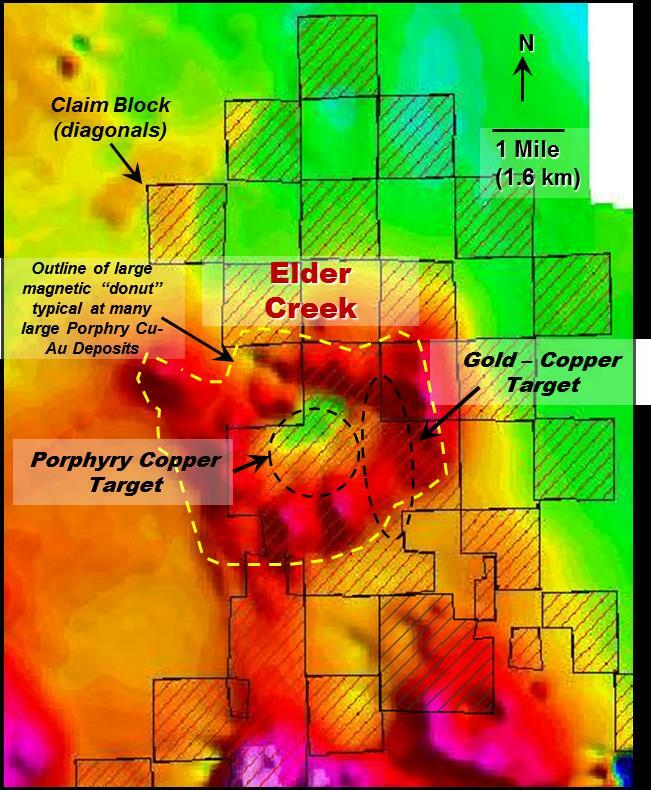 Exploration data compiled from over 40-plus years of exploration on the property includes a “donut-like” aeromagnetic signature with a magnetic high of hornfels that surrounds the porphyry core with a pronounced magnetic low. Timberline has the right to acquire a 65% interest in the 16 square mile (41 km2) property by spending US$5.1 million over 6 years through an earn-in joint venture agreement wiith McEwen Mining Inc. (see new release dated May 24, 2018 at http://timberlineresources.co/press-releases). Rock geochemical sampling results, along with geologic and geophysical characteristics evident at Elder Creek (see press release dated June 18, 2018 at http://timberlineresources.co/press-releases) are common to major porphyry copper deposits. 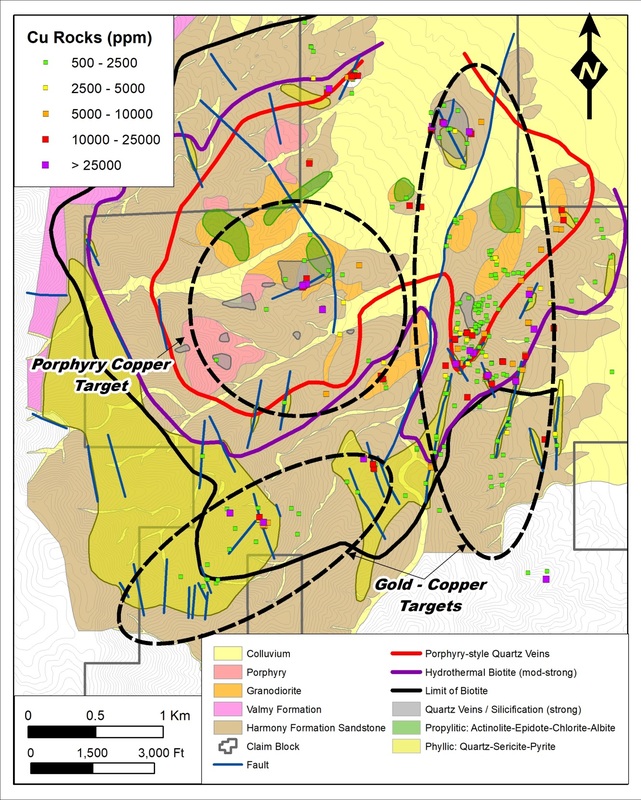 The core of the Elder Creek porphyry target covers approximately 1.7 square miles (4.5 km2), and has at least three intrusive phases which form two granodiorite porphyry centers that are similar in age (35-37 million years) to the intrusive rocks at Newmont’s Phoenix gold-copper mine. The core is characterized by intense porphyry-style quartz veining, and elevated copper and molybdenum values in rocks and soils. It is flanked by proximal potassic (hydrothermal biotite) alteration and distal biotite-pyrite-pyrrhotite hornfels. Large target areas of gold-copper veining occur within the hornfels to the east and south of the porphyry core. The Company will also conduct a district-wide gravity survey at the 23-square mile (60 km2) Eureka property (Figure 3) to help design a program to test the continuity of three deep, high-grade gold intercepts in a geological setting consistent with the large Carlin-type gold systems of the Battle Mountain – Eureka mineral belt. 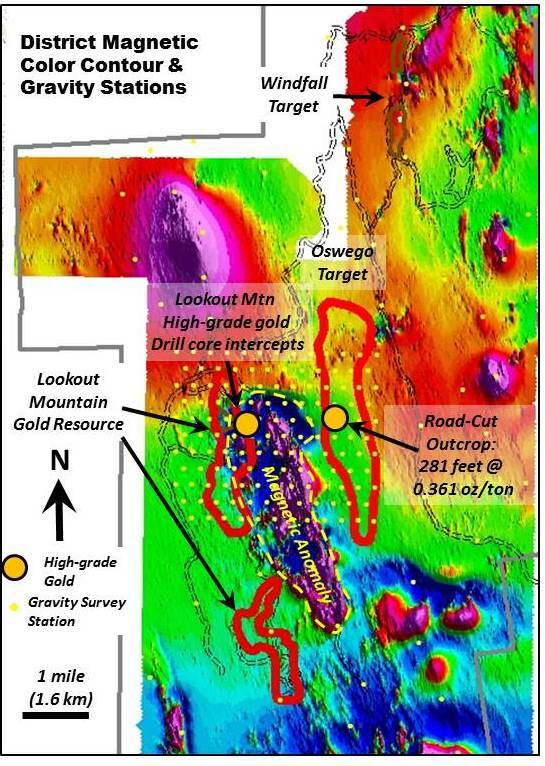 The survey will include detailed coverage encompassing the historic Lookout Mountain and Oswego Target areas, which contain documented high-grade gold occurrences (see press releases dated June 12, 2018 and July 10, 2018 at http://timberlineresources.co/press-releases). The survey will provide the very first application of gravity to this district, and help to delineate the subsurface stratigraphic and structural architecture of specific target areas such as Lookout Mountain. The Company is also pleased to announce that Mr. Donald McDowell has joined its senior management team. Mr. Donald McDowell will serve as Vice President of Corporate Development in addition to his current role as a Timberline Director. He has over 30 years of geological exploration, property evaluation, and development experience focused primarily on the mineral exploration industry in Nevada. Since 2008, he has served as the President of Americas Gold Exploration Inc., a private company dedicated to Nevada mineral exploration. In late 2017, he was instrumental in the acquisition of the Carlin Vanadium Property by Cornerstone Metals. Previously, he spent 17 years with major mining corporations including Nippon Mining of Japan, Santa Fe Pacific Gold and Kennecott Exploration, where he was involved in exploration, resource/reserve evaluations, and mine development. Mr. McDowell is a registered professional land surveyor in the State of California. Mr. Osterberg added, “We are very pleased to add Don to Timberline’s management team in this important leadership position. His wealth of exploration and property expertise will benefit the Company as we advance our projects in the current environment of tight capital markets. Timberline Resources Corporation is focused on advancing district-scale gold exploration and development projects in Nevada, including its 23 square-mile Eureka property, comprised of the Lookout Mountain, Windfall, and Oswego projects which lie along three separate structural stratigraphic trends defined by distinct geochemical gold anomalies; and as the operator of two joint venture projects – the Paiute project joint venture with a subsidiary of Barrick Gold, and the Elder Creek project joint venture with McEwen Mining. All of these properties lie on the prolific Battle Mountain-Eureka gold trend. Timberline also owns the Seven Troughs property in Northern Nevada, known to be one of the state’s highest grade, former producers. Timberline has increased its owned and controlled mineral rights in Nevada to over 43 square miles (27,500 acres). Detailed maps and NI 43-101 estimated resource information for the Eureka property may be viewed at http://timberlineresources.co/. Statements contained herein that are not based upon current or historical fact are forward-looking in nature and constitute forward-looking statements within the meaning of Section 27A of the Securities Act of 1933 and Section 21E of the Securities Exchange Act of 1934. Such forward-looking statements reflect the Company’s expectations about its future operating results, performance and opportunities that involve substantial risks and uncertainties. These include, but are not limited to, statements regarding the advancement of projects, and exploration potential. When used herein, the words “anticipate,” “believe,” “estimate,” “upcoming,” “plan,” “target”, “intend” and “expect” and similar expressions, as they relate to Timberline Resources Corporation, its subsidiaries, or its management, are intended to identify such forward-looking statements. These forward-looking statements are based on information currently available to the Company and are subject to a number of risks, uncertainties, and other factors that could cause the Company’s actual results, performance, prospects, and opportunities to differ materially from those expressed in, or implied by, these forward-looking statements. There are no assurances that the Company will complete the earn-ins on Elder Creek and Paiute projects as contemplated or at all. Factors that could cause or contribute to risks involving forward-looking statements include, but are not limited to, changes in the Company’s business and other factors, including risk factors discussed in the Company’s Form 10-Q for the quarter ended June 30, 2018. Except as required by law, the Company does not undertake any obligation to release publicly any revisions to any forward-looking statements.